Weather also changed my plans for today: I was planning on going to Fayetteville to buy some food and an attachment for my Kitchen Aid. So, I took my camera and here are some pictures of this snow day as we don't have it that often around here. and a nice warm lunch: buckwheat and a smoked green beans. I made some desert too, please, come back soon! Thank you Efty! I am very pleased. 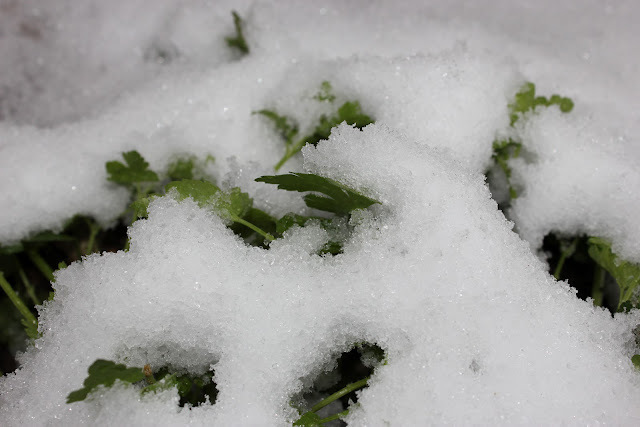 The green beans look amazing and I love the snow pictures! Oh my it looks cold where you are but those photos are so cool. Love the smoked beans. Is that really kale all snowed in? Where do you live, I am in Florida so this is a treat for me. Stop by and visit me sometime. Thanks Suzi! It is not usually that cold here in Arkansas. It was our first snow this season so far. 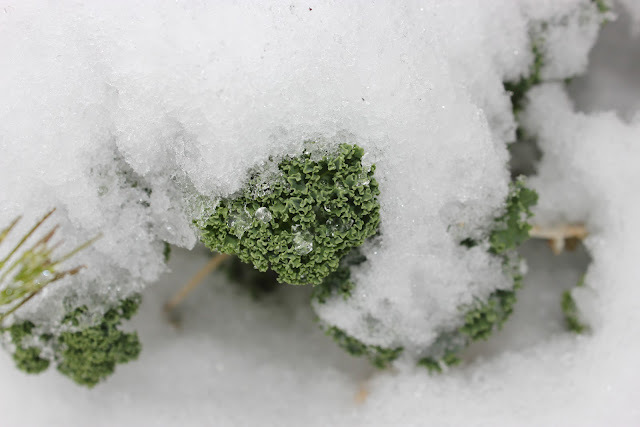 Yes, that's my kale all snowed in, isn't it cool?! I just visited your blog, it's lovely. 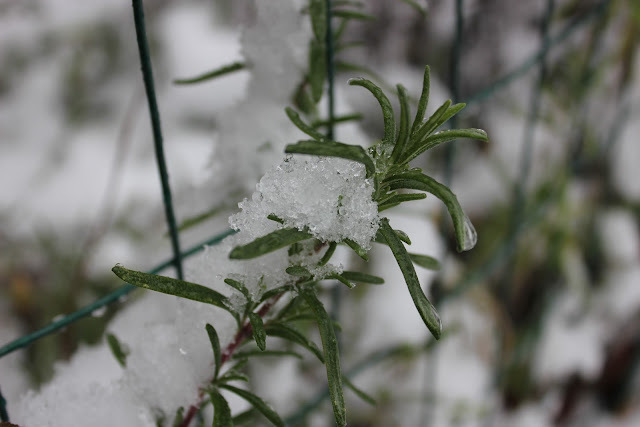 Your snow covered herbs and salad leaves pictures look good. I am getting hungry for those beans. Thank you Balvinder. I will post recipe for the green beans in a few days. All the pictures are lovely....and what I particularly liked was you showed us the cold, cold snow and then brought us in for a delicious, warm lunch! YUM~ Happy Valentines Day! Ann, I am so glad you are back! We really missed you. I hope your trip was great and I look forward to hear about it. Thank you for the comments. Happy V-day to you and all your family! Its hot here today and those snow pictures are making me feel lovely and cool. Really pretty. Thank you Liz. Is there a place where it's hot today?! I envy you. I don't like being cold. Even though Arkansas doesn't get so many snow days, I stil like it when it's warm. The beans look good :-) Your snow pics are really lovely! Thank you Suchi. 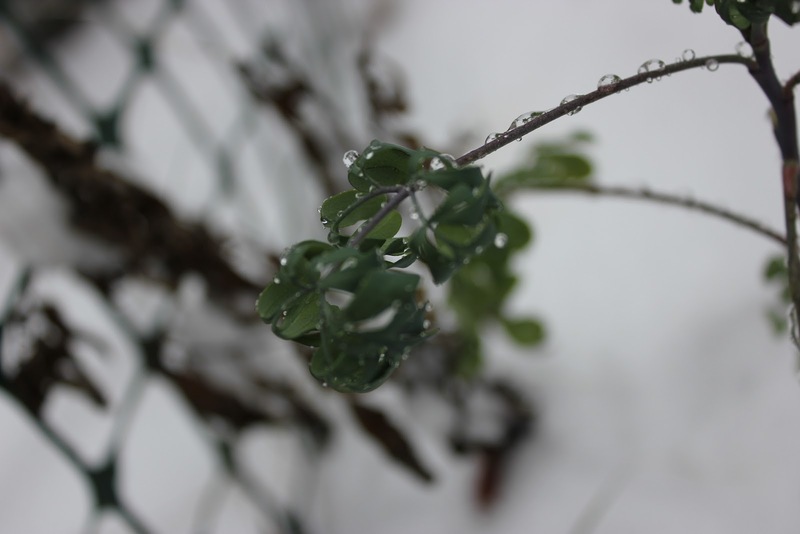 Snow is melting already and today temperature is around 12C (50F). Your snow pictures are lovely and I don't even like snow (smile). Every time I think about your part of the world my ears ache. When I went to school there my ears were always cold and I could never get rid of the ache in the winter. Funny because it's not nearly as cold there as it is in the northeast, which I found out later when we lived in the Poconos. Stay warm, enjoy the snow day and happy Valentine's day. Thank you Sam! My part of the world is actually a few states southwest from Carolina's. :) Arkansas doesn't get that many snow/cold days usually. But you are right about ears part: mine are always cold in the winter too. Although, I don't know much as it is our second winter here. Happy V-Day to you too! Great pictures and beautiful dish. Happy V day! Thank you Alida! Happy V-day to you too! Love the snow pictures. I didn't get any - it didn't last long enough here. 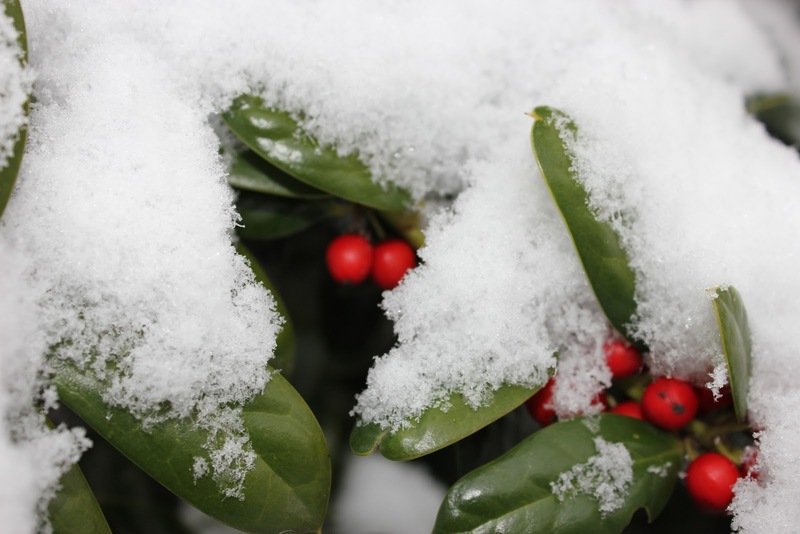 Forgive me, I cant imagine gardening in snow. Too Temperate focussed I guess. It IS all what you are used to! No, we had just one snow day actually so far this winter... Thanks for coming here!